Spotify has grand visions for their streaming music service, which go beyond its current status as a self-contained, self-developed set of apps. They want to open the service up to any developer that wants to add content and functionality to the service. Looking at the initial crop of apps, they're mostly coming from editorial sources, who will add articles and playlists and reviews. Spotify will have an app store, which they call the App Finder, which will allow users to add these new limbs to their desktop app. Spotify will have an approval process, which means that not just any garbage app can make its way in. Examples of apps include Rolling Stone (providing "best of" lists and articles), Last.fm (added social music discovery), TuneWiki (song lyrics) and SongKick (concert listings). But there appears little in the way of apps which improve the UI and UX of Spotify (which is lacking in many ways). However, Spotify will be using this new framework to make their own improvements as well, which includes a new Facebook-style ticker, showing what your friends are listening to right now. Hopefully this signals the beginning of some improvements on their part. Playing around with a handful of these initial apps (including Pitchfork, Rollingstone, Billboard and Songkick), there was definitely a common strand between many of these publications and services where they would build or incoporate their own playlists into Spotify, supplement their show listings, articles and reviews with links to songs and artists, or offer recommendations to their own content based on what you're listening to. One of the more useful apps, from a feature standpoint, was Moodagent, the playlist generator which has analyzed millions of tracks and will build playlists based around tempo, artists, and of course, mood. Existing within Spotify made using the app a convenient, thoughtless process where you could start with any song you liked and the app will throw a whole lot more at you it thinks possess the same vibe. Many of these apps, only being developed in the past couple of weeks were minimal, and reps for each company promised more features in the near future. I'd definitely like to see more dynamic generation of lists and recommendations—or even filters for general Spotify navigation—based on a certain criteria unique to each sites content. Some were hoping that Spotify would allow websites and developers to access the Spotify music database and play song directly from other sites. Unfortunately, that won't be happening. All of Spotify's app-based expansion will take place from within the app. 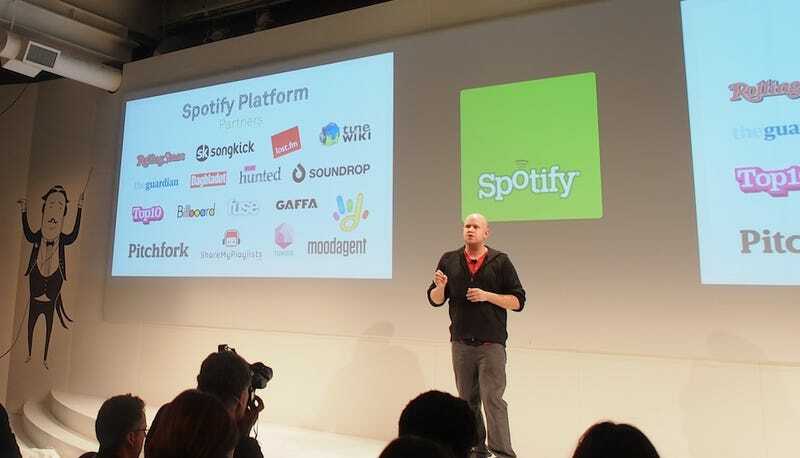 But it will be open to any Spotify user, regardless of whether they're using the free or premium service. Speaking to Spotify's VP of Product Development Gustav Soderstrom, he said that even more than partnering up with big sites and editorial outlets, he's excited to get the SDK out in the hands of programmers and seeing what weird things they dream up. He pointed out the social playlist startup SoundDrop as an example of the sort of functionality that could pop up on Spotify aside from curation and recommendation. He think's there's potential for some unexpected ideas, such as games, and the potential to provide functionality that might even outdo Spotify's own core features.